Taro root is present in many Indian and South East Asian dishes. High in starchy carbohydrates, taro roots look similar to small, brown knobbly potatoes. The root works in both savory and sweet dishes, though it's best in main dishes. According to Frederic Couton in "The Cannery Seafood House Cookbook," taro root is toxic if not cooked properly. 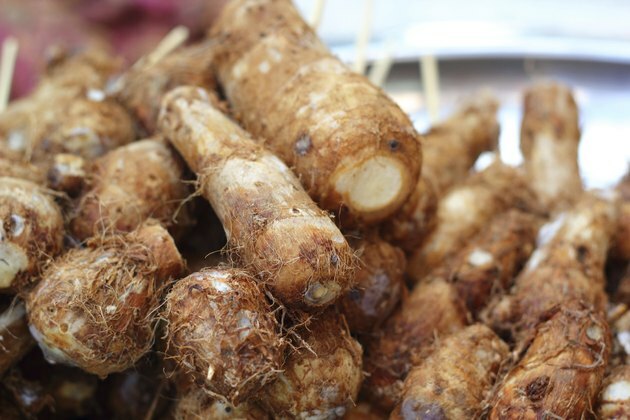 With its potato-like texture, taro root suits cooking styles such as deep frying in oil, boiling in water and roasting. Scrub the taro roots clean under running water. Peel each root using a vegetable peeler. Cut into quarters or 2-inch chunks. Fill a medium-size cooking pan with water, adding a sprinkle of salt. Boil the water on the stove. Place all the taro root pieces into the water. Boil the taro root for approximately 15 minutes. Stick a fork into the root to check the softness. If soft, drain the taro roots in a colander over the sink. Drop a piece of butter on the mound of taro roots and serve while steaming hot. Peel several large taro roots. Chop the taro roots into french fry-style shapes about 2 inches long and a half-inch thick. Heat vegetable oil in a deep fryer or large, heavy pan until very hot. Put the chopped taro roots into the oil. You should hear a bubbling sizzle. Cook for four minutes, then remove using a slotted metal spoon. Rest the taro fries on a kitchen towel layered on a plate. Allow the kitchen towel to soak up some of the excess oil. Allow to cool for 30 minutes or more. Heat up the oil again just before you want to reheat the fries. Put the taro root fries into the hot fryer oil and allow to cook for a minute. Remove and serve hot with tomato sauce or other rich sauces. Taro roots also mash well with a little butter and seasoning. Avoid eating raw or undercooked -- this could result in an upset stomach. Never deep fry in a shallow pan to avoid fires. Wear an apron and gloves when handling the deep fryer.